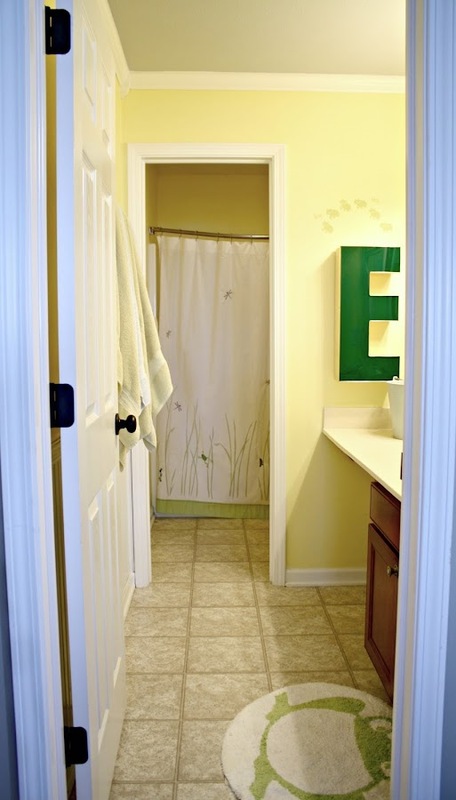 I've been hard at work painting my son's bathroom and had hoped to share it with you today but goodness…I forgot how much work it was to paint a bathroom! Especially with this one with the stupid wall that breaks the room in two -- it adds a couple walls and a lot more cutting in. 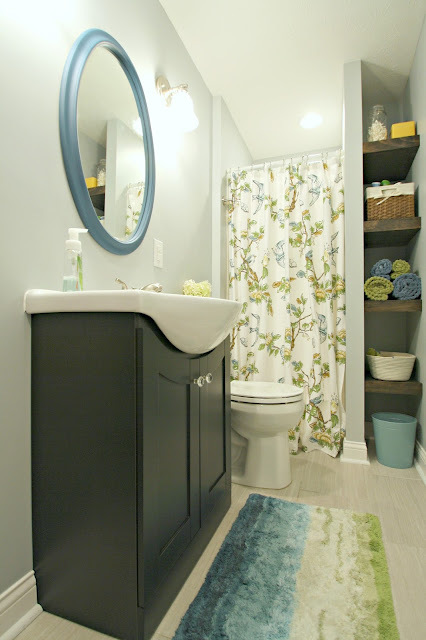 I haven't done much to our two upstairs bathrooms over the years (I've focused on our powder room and basement bathroom and basically all of the other spaces in the house) and there are two big reasons for that -- bathroom renovations are (typically) expensive. Duh. Also, I have to wait till the final design pops into my head. Seriously, it can take years before I know exactly what I want to do with a space, and I won't do much till that happens. I think I'll keep the large mirror and if so the actual area that will be tiled will be pretty small. LOVE that look! 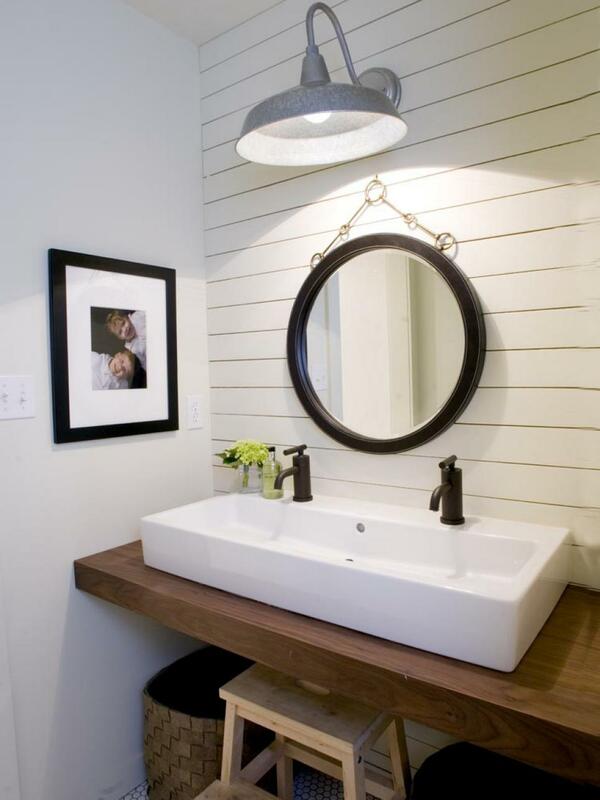 I've always loved the look of open vanities in bathrooms. 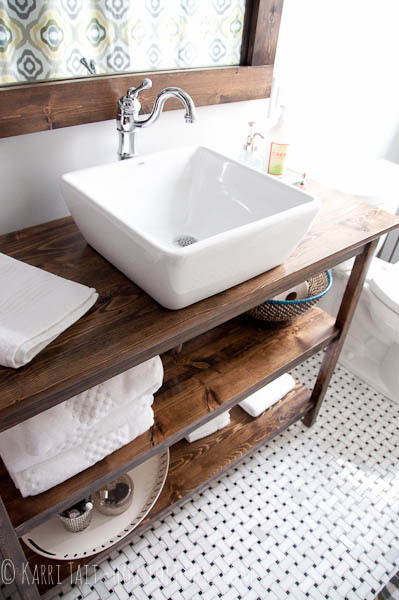 I know they aren't for everyone but I think they look fantastic and offer way more functional storage than a typical vanity. So far the costs aren't too bad! We'll decide later if we'll keep the basic builder tub insert or replace and tile it -- if we do it will be a basic subway tile. I'm not sure if it's worth that investment. As far as lighting, I still plan to add a window above the shower. I think it will make a huge difference in that room. HUGE. Especially with the wall down and the room opened up -- I have a feeling it will feel twice as big. Since the wall will be down in the bathroom and we'll have easy access to the ceiling I plan to add a couple recessed lights as well. Dang it! I'm so excited now and want to start this next week! Not happening though. The room will be completely transformed and I think I can do it for a great price. 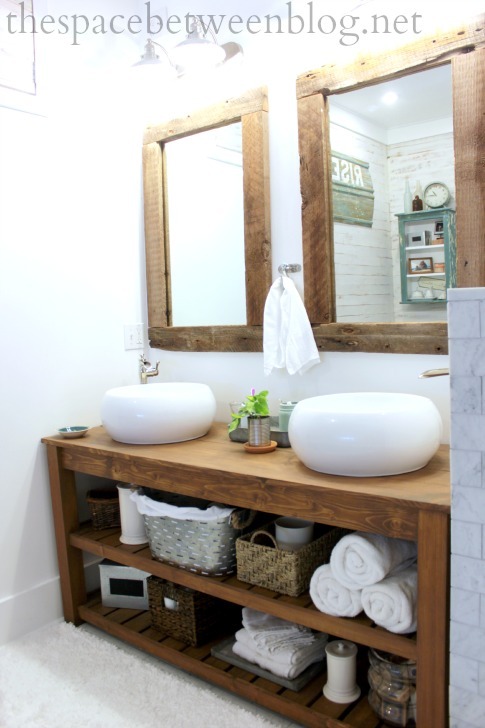 This will be my first big bathroom renovation -- the biggest change in our powder room was the planked wall treatment I added. Our basement bathroom was built from the ground up but I think that's easier than renovating what's already there. Have you implemented any of these in your bathrooms? Please share if you have! Have a great weekend my friends! So exciting! That tile is fabulous! I'm sure what ever you do will be amazing! Looking forward to seeing this transformation as our master bath is almost the same layout. I have wanted to knock that middle wall out for 6 years!!! I just painted ours last week as it needed the update before budget will allow a renovation. I love your plans! I wanted an electrician to install a light fixture in a closet I made into a library for the littles (inspired by your reading nook)! He told me that regulations didn't allow fixtures to be installed indoors that were open at the bottom. If the bulb bursts, fragments of hot stuff could ignite something below, like the cushions. 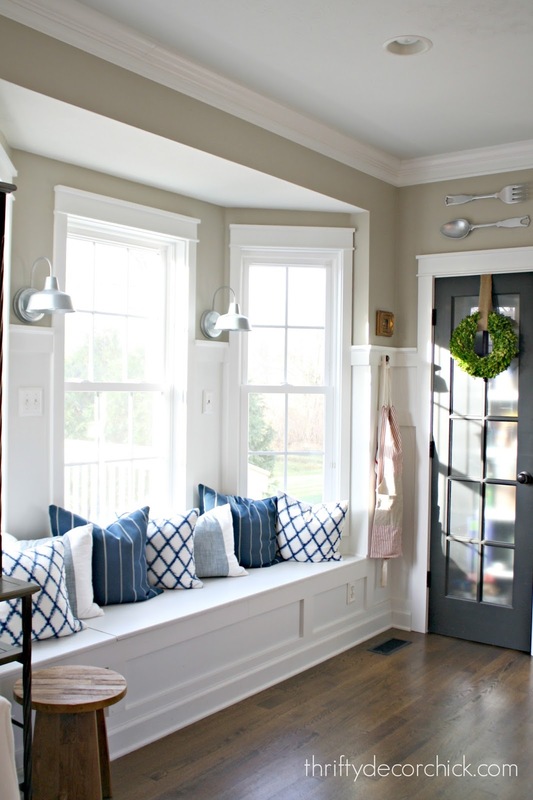 Did you have those issues with your gorgeous fixtures? I would suggest you get a second opinion from someone else. Hmmm...what about ceiling fans and vanity lights? Hello Mary Lou! I agree, I would get a second opinion. Nearly all of our interior lights have an open bulb, and I've never had a bulb burst. Maybe it's a local code for you? I love every single idea!! I can't wait to see how it comes out! i love the tiles in the second bathroom!! we did something very similar to that on our ceiling of our bathroom!!! best of luck to you!!! Your idea for your bathroom look beautiful! Can't wait to see how it turns out! 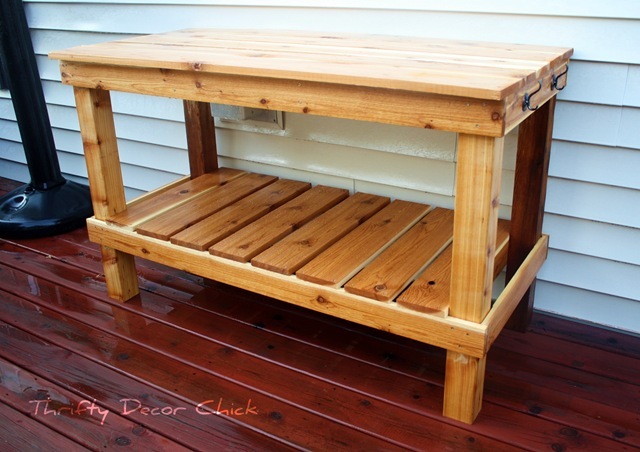 I thoroughly following your blog and am amazed at the number of projects. We built our home 13 yrs ago and am now wanting to change things up. My biggest stumbling block is my husband. If its not broke, don't fix it. 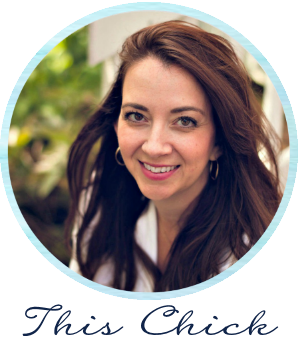 How do you get your hubby to agree to your changes? Hello Sue! You know he's always just let me do my thing -- I think as long as I don't ask him to help he's fine with it. ;) He does have strong opinions occasionally and I always keep those in mind when making changes. I love all your ideas! How long did you say you're restraining yourself from tearing that wall down?! I have that same bathroom and have also waited for years to tear the wall down. Doing it next month and I got some ideas from your original post about what to do in there. Can't wait! I'll be looking forward to your progress as well. I can't wait to see the transformation! I love all the elements you've picked, and I think it is going to look amazing! Amazing! I like your new bathroom and wanna to do this to my 30 years old bathroom. 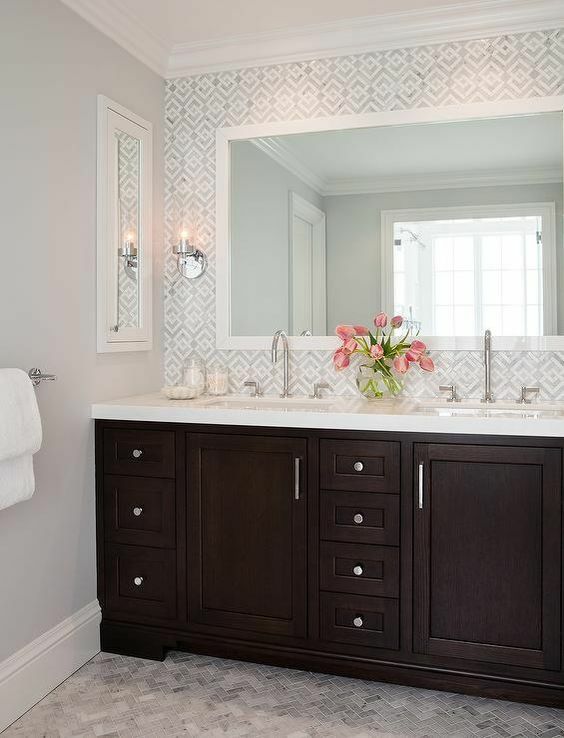 You will love the large dark gray tile in the bathroom. 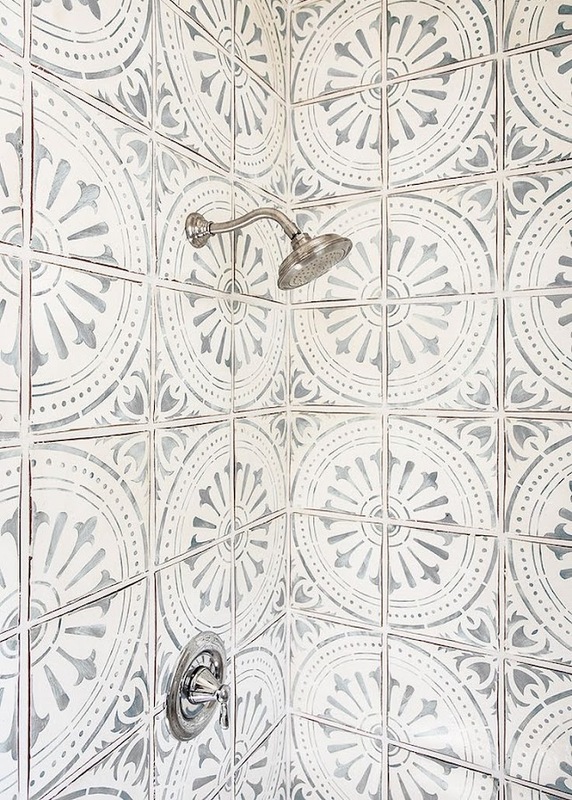 We are currently in the process of installing this exact same tile in our hall bathroom. 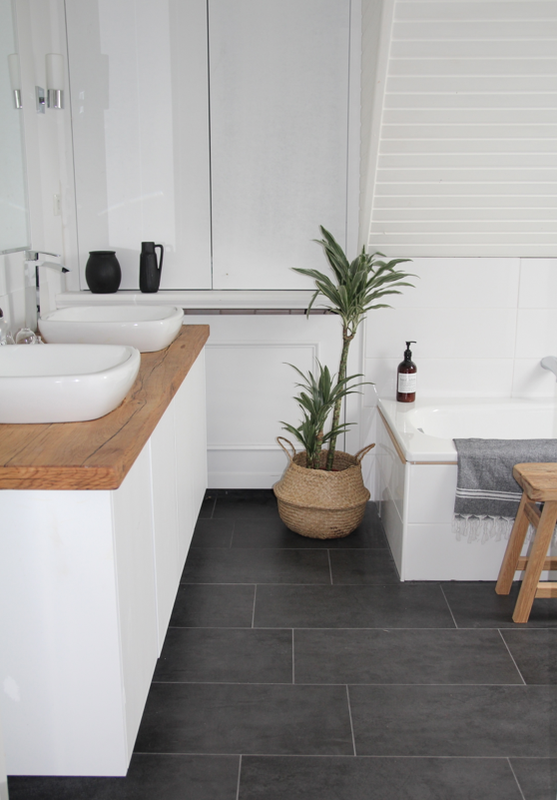 We used large dark charcoal-colored tile in our boys' bathroom and it was the perfect choice. We also installed radiant floor heating below the tile, so it's cozy for bare feet. Great reuse of the potting table! Hello! I am new to the blog and I LOVE your vision! I am very impressed by how meticulously you plan and save, so few bloggers draw attention to that part of the process. You have a wonderful way of being content in your home, while still excited about improvement. I find that incredibly encouraging! I was wondering if you could lay out the step by step process for how you remove a wall. Do you to any of it yourself? Do you have a contractor that you consistently use? If so, how did you find this contractor? What is the cost of removing a wall or half wall? 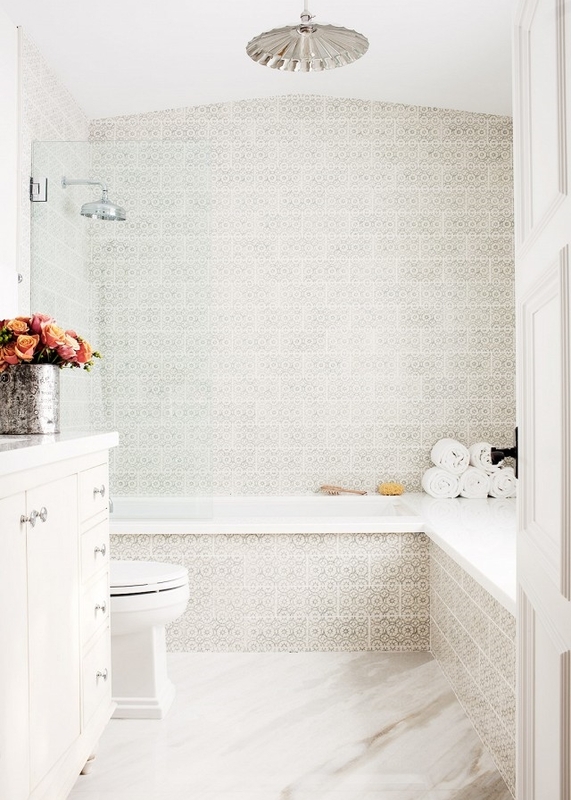 The basket weave tile on the floor is dreamy!